I would be lying if I said I was more than a little daunted at first by the prospect of standing in front of a class of 30 or so excitable Nepali children and trying to teach them English, but after getting over the initial nerves of the first few lessons, I soon settled into my daily timetable and started to enjoy getting to know my pupils and exploring the English language with them in as many enjoyable ways as I could. 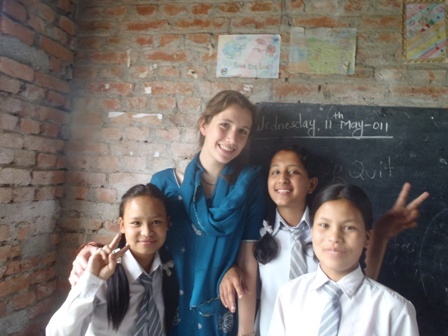 I quickly decided to leave the structured grammar and vocab lessons to the Nepali teachers (having learnt English at school from a young age, many pupils were familiar with the basics already, and were, unsurprisingly, not particularly interested in having to learn more). Instead I branched out to stories, poetry, songs and plays (and the hokey cokey) in order to bring something new to their classes and keep them engaged. I introduced my oldest class to a very abridged, and reworded, version of Romeo and Juliet – I had initially intended to have them all acting out scenes themselves, but soon discovered that 15 year olds are the same across the world, and are very reluctant to risk making a fool of themselves in front of their peers, so, determined to plough on, I proceeded (with the help of the only willing volunteer in the class) to act out the whole of Romeo and Juliet’s party scene myself. The class were hooked, and so, it would turn out, was a local old man passing in the street, who (much to my embarrassment and the amusement of the class) stopped outside the open door to watch. Being musical myself, and having enjoyed singing in school, I decided to introduce music to my pupils too and embarked on teaching my Class 6 ‘Doe a Deer’ from The Sound of Music. I had brought some recorders with me, and initially used these to teach them the tune. Much to my delight, it was a huge success – the class picked it up quickly, and loved the novelty of doing something completely different. The word spread quickly, and soon I had several of my other classes requesting to learn songs too. By the end of the four months at least half of my classes were able to perform the song by heart, and delighted in showing off their skills whenever they could. When it finally came for me to leave, I was extremely touched by the leaving ceremony which was put on for me at the school, and started to realise that I really had made an impact on the children’s lives. On my final day, I sat at the front of the whole school as they lined up for morning assembly, and as they filed off for their first lessons, they passed by my seat to say a personal goodbye, many giving me gifts and flowers they had brought especially. By the time the yard was empty of pupils, the table in front of me was full of brightly coloured foliage, and all of a sudden I was overwhelmed by their gratitude, and very sorry to have to leave them all behind. 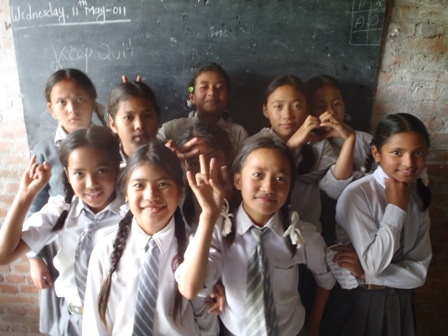 To learn more about the Nepal volunteer teaching project, click here.